Posted on October 5, 2014 by revivewa	in Features and tagged feature, Voices for the voiceless. For most people who’ve done reasonably well at school, reading and writing becomes a natural part of life. But, unlike the spoken word, there’s actually nothing natural about it. Written word is a social construct which has only fairly recently, in historical terms, been so widespread. Literacy is an ‘enabler’ – we learn a lot of other things through it, especially while we’re still at school. So for many, struggling with literacy can actually make them feel excluded from the world around them, which is centred around numeracy and the written word. In 2013, the Organisation for Economic Co-operation and Development (OECD) ranked Australia fourth out of 24 countries in literacy, in their First Results from the Survey for Adult Skills. Comparatively, in 2013 The Australian Bureau of Statistics (ABS) found that 44% of Australians are at or below level two in their literacy skills. Level three is considered to be a reasonable functioning level for Australian society. While you don’t have to be living in poverty to struggle with literacy, findings show that it is people from a low socioeconomic background who often suffer the most. If you don’t struggle with it, you may never actually realise just how much reading and writing connects us to our surrounding world. Margaret McHugh is the West Australian representative from the Australian Council for Adult Literacy (ACAL). She said that when people struggle to read and write, it affects their lives in numerous ways. Statistically, “People with poor literacy are less healthy, they’re more likely to go to jail, they’re more likely to be unemployed, they’re more likely to be poor, and on whatever other measures you can find for a less secure life, you’d probably find those correlations,” she said. ABS survey results support this, finding in 2013 that 60% of unemployed men and 61% of unemployed women have a literacy score at level two or below. In 2008, findings show that employed people with a literacy score at or below level two earn a median weekly income of less than $504 – much less than those in level three or above. However, Margaret also notes that these are purely statistics and do not represent all situations. Many people who struggle to read and write can also lead very successful lives. “There isn’t a correlation between having poor literacy – that is, not thriving at school – and intelligence,” Margaret said. She said that there are many successful people who struggle with literacy that put into their lives ‘props’. By ‘props’ she means that people become really good at finding ways around not being able to read. Admitting to people you can’t understand something can be extremely embarrassing and soul crushing. The stigma attached to not being able to read is just too much for a lot of people and prevents them from coming forward to ask for help. So they find ways around it, often which are quite amazing. Kim Brooklyn, executive manager of Strengthening Communities at UnitingCare West, agrees. While UnitingCare West doesn’t directly have any programs to help people to read and write, they do help people with literacy as individuals come to the organisation through its many different avenues, including financial counselling, helping people to fill in forms and making sure people understand their medications. “We see the impact of people’s difficulty with literacy on numerous levels and that reflects most of the research too,” Kim said. She said that often people who haven’t picked up literacy skills still manage to learn how to get by. This usually involves using different mechanisms and thinking about things from a different angle; instead of being taught how to do something, they’ve figured out a way to do it themselves. “Even when people don’t have all the skills around literacy, they will develop others. Sometimes we need to be reminded of that too, how smart people really are,” Kim said. Janette Shoosmith (right) leads and english conversation class at Kardinya Uniting Church. Literacy in Australia is not just about people who have fallen through the cracks. Many new people to our land also struggle to understand the world around them if their English isn’t very strong. Even though new migrants are offered 510 hours of English language tuition through the government’s Adult Migrant English Program (AMEP), it is often not enough. 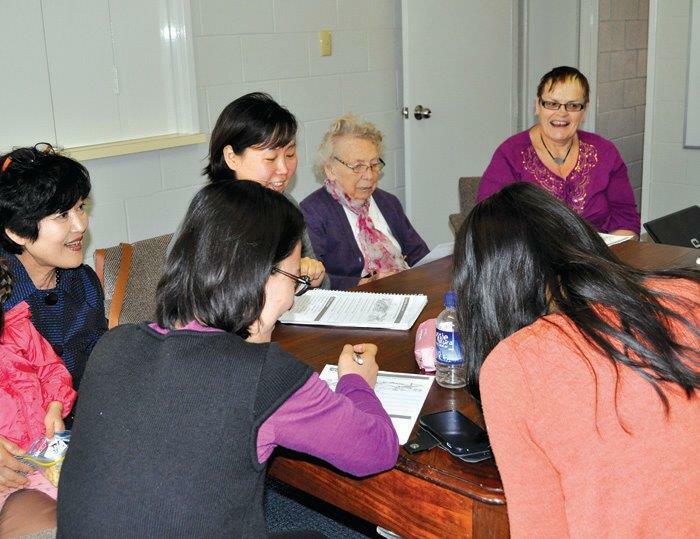 Some Uniting Church congregations in WA have noticed the need for English conversation classes and have acted on helping people in their local communities, including Nedlands, Floreat and Como Manning congregations. Kardinya Uniting Church holds classes each Monday for anyone who wants to strengthen their understanding of the language and also learn a bit about Australian colloquialisms. Sue Kim is originally from Korea and has been living in Australia for around four and a half years. She attends English Conversation Classes at Kardinya regularly and finds that it has not only helped her improve her English, but has also helped her understand a bit about some of the unspoken ‘rules’ of Australian culture. Sue said that at the group she is able to ask questions about forms and contracts which are all in English, such as rental agreements. The language barrier also means making Australian friends is difficult, but the classes have provided friendship. For those who have fallen through the cracks of the education system, Margaret McHugh believes that it is not a failure of the student, but a failure of the system which is teaching them. She said that anyone who doesn’t fit the learning system at school can struggle with literacy throughout their life. “You have to think of it as a failure of teaching, rather than a failure of learning,” she said. “Everyone goes to school and half the population doesn’t end up with enough of these cognitive processing skills. Which doesn’t mean to say teachers fail, I’m talking about teaching as a whole set of institutions: how teachers get selected, how they get trained, how they get paid, how they are viewed by society. Whether someone is learning English as a second language, or have struggled throughout their education, reading and writing is always something people can get better at. With the right support, it is never too late to improve literacy. While Margaret stressed the importance of adults getting the right kind of education they need so as to not have a similar experience that they had in school, she said that it is human nature to keep improving. Want to attend, or know someone who is looking for, an English conversation class for people with English as a second language? Contact these congregations for more info.